It’s a new week and I think we should start it right, shall we? a keen sense of what is appropriate, tasteful, or aesthetically pleasing; taste; discrimination. touch or the sense of touch. 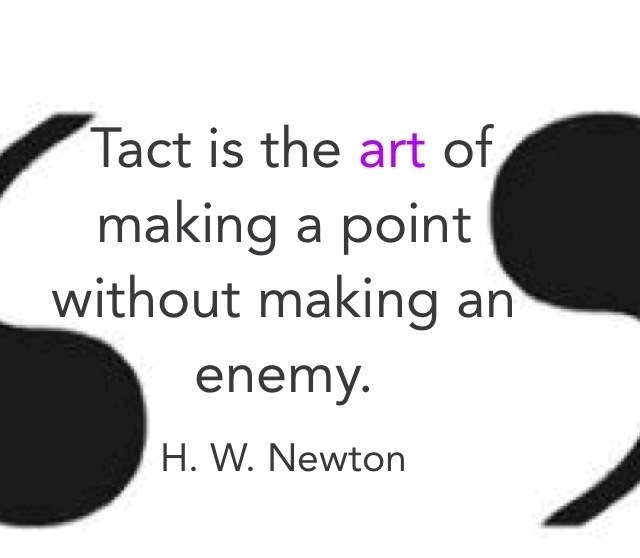 A tactful person is mindful and definitely avoids to be rude or careless. There are many benefits when you consider to improve your communication skills by giving a more sensitive response. A few examples would be when you have to decline an invitation, give constructive feedback to one of your team members, tackle rumours at the workplace or when your company goes through layoffs. Tact is needed in all of these situations and will make a difference for all the people involved. You always want to keep in mind that you deal with human beings and you don’t want to destroy someone’s self-worth. Unfortunately I have met people in very high positions who really don’t care about that but you wouldn’t be reading this right now if you would be one of these people. A person’s self-worth is in direct correlation with the company’s net-worth. If people don’t believe in their abilities, how can they help their employer to get to the next level? It is important to communicate the truth and it is even more important how we do it.